The Arcade Machine offers retro-style minigames in Splatoon and Splatoon 2, all played on the GamePad in Splatoon. They can be played in the Lobby for online battles as well as accessed on their own via the physical Arcade Machine in Inkopolis Plaza and Inkopolis Square. When a minigame is interrupted by a battle, the player's current progress is saved automatically and can be continued next time. However, progress is not saved when Splatoon itself is closed; upon starting the game again, minigames are reset to their first level. In Splatoon, there are four minigames in total: Squid Jump, Squid Racer, Squidball, and Squid Beatz. Only Squid Jump is unlocked by default, with the other three given as rewards for defeating The Ravenous Octomaw! in amiibo challenges. The Arcade Machine features four different minigames in total, with all the amiibo challenges completed. 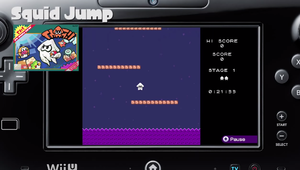 Squid Jump (Japanese: イカジャンプ ika janpu) is the first of these games, and was the only game playable in the Splatoon Global Testfire. This game has the player make a squid jump from platform to platform, holding down the button for longer to get a higher jump and using the or the to move. To prevent the player from staying still for too long, purple ink will chase them after a certain amount of time. As the stages progress, different types of platform are added: ice (which is slippery), clouds (which move back and forth), and conveyor belts (which come in multiple speeds and move a squid resting on one). The game has 25 stages and after every ten, the background changes, the score per stage is doubled and a checkpoint is saved. The player has three lives. Once they have lost all of their lives they can choose to either restart the game or go back to the last checkpoint. The fish makes the player jump immediately upon contact. The Jellyfish lets them jump once in the middle of the air; they cannot jump in the air again until they either land on the ground or pick up another Jellyfish. The starfish increases the player's acceleration, both from jumps and from gravity; this means that picking it up usually means that the squid will immediately begin falling faster, but if the squid is jumping upward while the star's effect wears off, the result can be an extremely high jump. The player gets an extra life every 10,000 points. 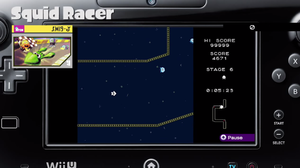 This minigame is a race between the player, as a white squid, and their blue jellyfish foes. The aim is to reach the end of the map before time runs out, avoiding touching the jellyfish and the sides of the stage, which slow the player down. The or the is used to steer, is used for accelerating and for drifting. While the player drifts, they cannot change direction, but steering still causes the player's squid to rotate. Releasing it shoots the player's squid in the direction it faces. Holding the button during the second half of when the number 2 appears during the countdown triggers a starting boost very similar to the rocket start in the Mario Kart series. There are thirty stages and after every five stages is a checkpoint. Every track has a time limit. Once time runs out, the player will lose a life. The player gets three lives, with additional lives being earned every 10,000 points. Once they have lost all their lives, they can continue from the last checkpoint reached, or restart from the beginning. While the player gets a bonus to their score based on both their time and how many jellyfish they beat to the end, it's not necessary to place to proceed. The red fish gives the player a speed boost. The Zapfish lets the player swallow jellyfish by touching them, making the squid larger and faster. The green sunfish dramatically increases the player's turning speed while drifting. The player can benefit from only one power-up at a time, so it can sometimes be advantageous to avoid picking one up so as not to replace a more useful one. The third game is Squidball (Japanese: イカボール ika bōru), which is unlocked by the Inkling Girl amiibo. There are thirty stages in it. In this game, the player (a squid) has to hit the Jellyfish on the other side of the net with a ball (shaped like a Zapfish) to score points. The mechanics are similar to volleyball, with a bump, set, and spike. First, the squid is stuck to the ground and can move using the stick or the and can only bounce the ball upward (at an angle based on where on the squid the ball struck) by letting the ball bounce off it. 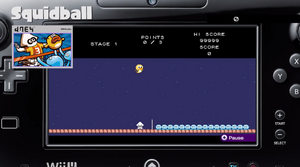 Second, the player must press to jump, then press while touching the ball to hit it, or the player can continue to hold the from jumping to hitting the ball to hit it. The angle of the ball changes with the direction held when launching it, which can be either neutral, back or forward. The player must spike the ball for it to count; a ball immediately bounced over the net will pass through the jellyfish harmlessly. The player gets three balls per stage: one small, one medium, and one large. If the specified number of targets is not reached with all three balls, the game is over and the player can restart from either the beginning or the last checkpoint. After every five stages is a checkpoint. Each stage has a fixed number of points awarded for completing it, with bonus points awarded for having balls in reserve or exceeding the required number of hits. In addition to jellyfish, other creatures can appear on the far side of the net. Starfish are just like jellyfish, but one starfish is worth three jellyfish. Green sunfish burst into fragments when hit, and the fragments can hit other creatures. Sea urchins are obstacles: a small ball will be stopped completely, a medium ball will destroy the urchin but will itself be destroyed, and a large ball will destroy the urchin and keep going, but with greatly diminished momentum. The last minigame is Squid Beatz (Japanese: イカラジオ ika rajio), which is unlocked by the Inkling Squid amiibo. This game is a music player featuring all 31 tracks from Splatoon and is also a standard rhythm game. switches between no game, normal mode, and hard mode, and is the play/pause switch. The player has to press the control pad and buttons represented on the line at the bottom at the correct time to turn the Jellyfish into yellow rabbits. The player can press any direction on the (or ) when a control pad icon shows up, or , , , or when an icon representing the buttons shows up, to play the song correctly in tune, but there is no penalty and risk of losing rabbits if the player presses any of the aforementioned buttons. Each of the buttons has two different sounds depending on whether the normal or hard mode is selected. While waiting for a match to start, Bob Dub's Dubble Bath is the default song played. By pressing and at the same time, any selected song can be played as if one was using the arcade machine. 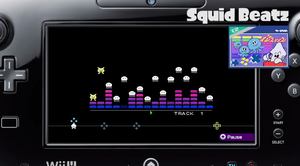 Squid Beatz was updated in Version 2.0.0 to include the four new tracks added and their information. It is the only game not to have a numbered scoring system - instead, it uses yellow rabbit-type creatures to track the score. It is also the only game not to save progress between matches. All text is stylised in capitals in Squid Beatz. In Splatoon 2, there is only one arcade game, Squid Beatz 2. As the sequel to Squid Beatz, it is also a rhythm game in which the player presses buttons to the beat of songs from Splatoon 2. Tracks 1 through 8, 27 through 30, and 43 through 54 are available from start; 35 through 42, and 55 through 57 are unlocked by amiibo; the rest are unlocked after they have been heard in-game for the first time. Registering the Pearl and Marina amiibo as a supporter and fulfilling certain requirements will allow the player to unlock new themes for Squid Beatz 2. Squid Beatz and its sequel, Squid Beatz 2, are based on the Bandai Namco rhythm game series Taiko no Tatsujin. Jellyfish have featured in some way in each of Splatoon's arcade games. The rabbits in Squid Beatz are likely a reference to an early stage of Splatoon's development wherein the protagonists were to be humanoid rabbits. The art for each of the four games parodies that of NES games from popular studios. Squid Racer's artwork is based on Irem's titles, Squid Beatz' is based on Namco's, and Squid Ball's is based on those of Nintendo. The art for Squid Jump resembles the Famicom box art for Super Mario Bros. The Arcade Machine is also featured in Ancho-V Games, with four individual machines throughout the stage. Unlike the one in Inkopolis Plaza, they cannot be interacted with. Ancho-V Games is said to have developed Squid Beatz. Several official sources also cite them as the developers of Squid Beatz 2. The red fish from the minigames are similar to Cheep Cheeps found in Mario games. To be able to play the final boss music tracks, I am Octavio and Calamari Inkantation, as well as the one from the credits (Maritime Memory), the player must first beat DJ Octavio in Enter the Octobot King!. There is no reward for completing any of the minigames. Once the player has passed all of the stages in one of them, a sign saying "Congratulations!" will pop up and the game will reset to the first level. The squid is always white in the games. White squids are not seen anywhere else in Splatoon with an exception of three Splatfests - Lemon Tea vs. Milk Tea, Mayo vs. Ketchup and Chicken vs. Egg. In Splatoon 2, arcade machines featuring the artwork from Squid Jump, Squid Ball, and Squid Racer can be seen inside the Shoal when looking in from outside the entrance. In Squid Beatz 2, songs from the Octo Expansion go out of order and start at 80, following the prominent theming of the number 8 in the Octo Expansion. However, the Dedf1sh songs unlocked through the Octoling amiibo do not follow this pattern. In Splatoon 2, when going to Murch in Inkopolis Square, the sound effects of Squid Jump can be heard from his phone. After moving the camera, however, it is seen that the screen of the phone is blank. In Squid Beatz 2, in the arcade machine and in the title screen, the title "Ika Radio 2" can be seen. 'Ika' in Japanese means squid. This is also referenced in the Japanese name for Squid Beatz 2. Arcade Machine selection after unlocking all four games. The selection menu on for Squid Beatz. Clear view of the Arcade Machine in Inkopolis Plaza. The pixelated squid seen when starting up the Arcade Machine. An Inkling looks at an Arcade Machine at Ancho-V Games. Two jellyfish in a small room next to another Arcade Machine. Magazines at Ancho-V Games, with the squid and a scene from Squid Jump as well as a scene from Squid Beatz. Another set with Squid Jump (center). The title screen for Squid Beatz 2. This page was last edited on 12 April 2019, at 16:47. This page has been accessed 74,132 times.